Do you have long-haired pets? I have one cat and, over winter, I save the hair from her daily brushings to give to birds for their spring nests. 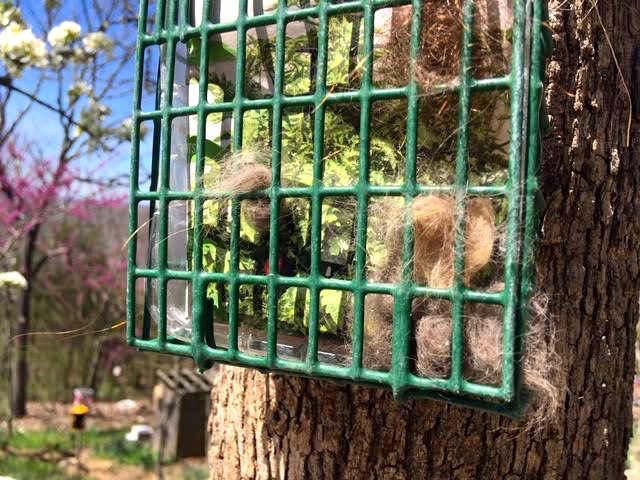 There have been a number of suggested bird nesting materials and some are do nots: aluminum, plastic, human hair, yarn and dryer lint. Also on the do not use list are string and dog hair. The best nesting material I have found to date is the long cat hair. It lasted less than a day in the repurposed suet feeder, now refreshed with a second batch. Later this year I will check birdhouses and look for tufts of cat hair sticking out of nexts and birdhouse corners. The cat fur is a favorite because it is very soft and warm, giving the nest extra insulation and protection. To save your long haired cat fur, clean your brush after every brushing session. Clean your winter suet holder before filling with pet fur, then hang back on a tree. If you can watch the suet holder, periodically check it and you may catch a bird helping themselves to the fur. 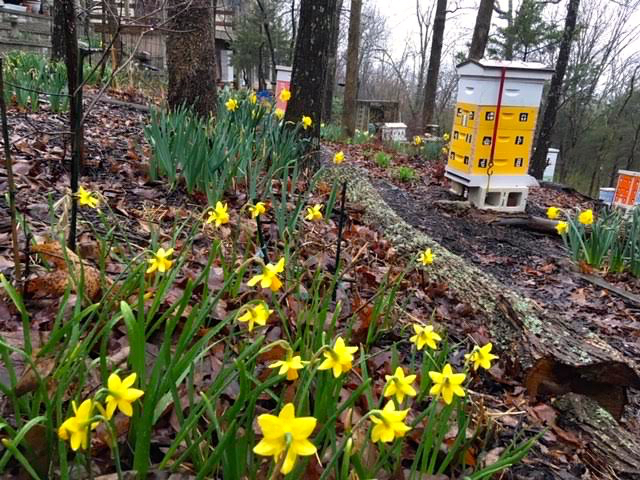 If a bee skep represents beekeeping then cattle panel arbors represent Ozark backyard gardens. Over the years, I have seen many of these either spanning garden beds or forming welcoming arbors in front of farm houses. 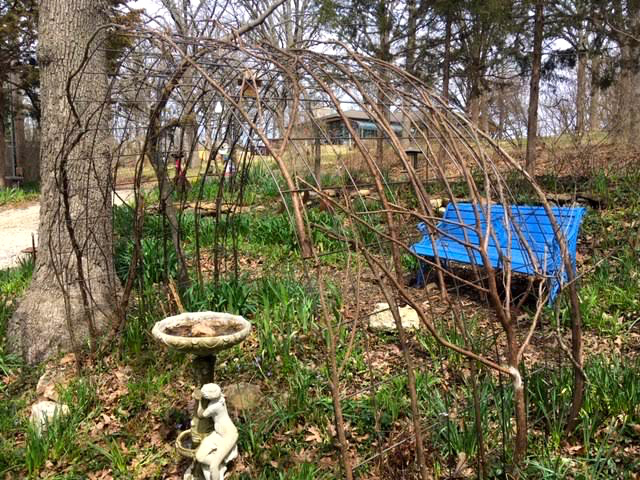 When a friend showed me how to bend these metal structures to form the arbor shape, I started to add them to my garden. If you have shopped for garden arbors, you know they can be quite expensive so having an alternative that provides for creativity was right down my alley. Once painted black, the cattle panel arbor nicely disappears into the background but I still wasn’t happy with the overall look. The same friend who showed me how to bend the cattle panels made a lovely gate out of cedar boughs, which inspired me to add cedar boughs to the cattle panels. Carefully cutting the boughs so I that i can weave them through the metal squares, I started to add cedar limbs from discarded trees from our local recycling center. Setting them two squares apart, they form the skeleton for the overall cedar covering. I have the structure in, now to collect, clear and add more cedar boughs. I already have grapes and blackberries growing over the cattle panels so it will be a matter of time to see who covers the cattle panel first, the plants or me! This is an excellent way to reuse long-lasting cedar while giving the cattle panels a nice texture and finish. I like to have seating areas all around my garden, places where I can sit down and enjoy the view. Some of the areas have arbors, others now have these cattle panel arbors that will provide shade. Each of the cattle panel arbors have plants already growing over them: blackberries and grapes. Over a couple more arbors rescued clematis vines are being encouraged to grow. Looking forward to seeing these arbors covered in green! I have a “Christmas” cactus blooming right now, the first day of spring 2019. I’m embracing the blooms and calling it my Spring cactus although there are different Schlumbergera plant relatives, one that is currently a Thanksgiving cactus called a Christmas cactus; the original Christmas cactus (in photo) no longer on the market and an Easter cactus that is not even related. These hardy but tropical plants need a little help to bloom on cue here in North America. Back in their native habitat in Brazil, they have weather triggers to get them to bloom in December, the beginning of the South American summer. I grew up near their native habitat, Christmas without swimsuits still seems a little odd to me but now I’m happy just unwrapping them as a gift and staying bundled up in my coat and blankets. Most cactuses sold on the market today are actually Thanksgiving cacti, which explains why they tend to bloom end of November. They are also grown in greenhouse conditions to get them to set bud for sale around Thanksgiving. To determine what kind of cactus you have, look at the green fronds. The original Christmas cactuses (Schlumbergera bridgesii) have smooth, round edges (photo) while Thanksgiving cacti (Schlumbergera truncata) have pointy, jagged ones. My Thanksgiving cactus started to bloom because I had it outside on my back porch earlier this fall. The cooler temperatures triggered the buds to form without my doing any adjusting to the amount of light it was getting every day. Holiday cacti are called "short day plants" meaning in order to produce flower buds, they require fewer daylight hours and/or cool night temperatures. The shorter days and cooler nights signal the plant to produce buds. I have tried both triggers and found the cooler temperatures are the easier way to encourage blooms. To get your holiday cactus to bloom when you want the blooms, locate holiday cacti indoors in a cool, bright location where daytime temperatures are 65-70° F and evening temperatures are 55-65° F. If plants are exposed to cooler night temperatures of 55° F, plants will bloom in approximately 5-6 weeks, sometimes regardless of the day length. 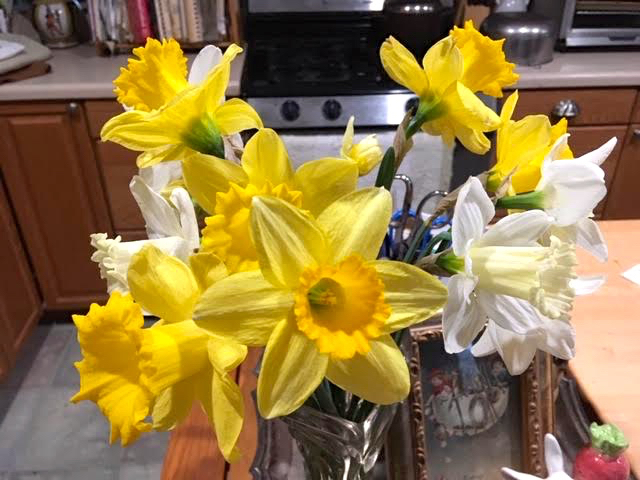 I frankly don’t mind when they bloom out of season, it reminds me of how I enjoy my “Let it Snow” Lap Quilt Throw after Christmas as well. I just love having them in bloom any time they decide the time is right. Did you know tulips are edible? As members of the lily family, they're also related to onions, which may explain the first part. Although I rarely hear anyone promote tulips for a meal, they do make for a lovely addition to any dish assuming no chemicals have been applied to them as they were growing. One other interesting thing about tulips. If you have them planted in a bulb garden, watch the flowers follow the sun by literally moving in the dish. They will also do that as cut flowers in a flower vase. According to the National Garden Bureau, tulips say “spring” like no other flowers. Their "vivid, paint-box colors are a feast for winter-weary eyes" and I couldn't agree more. Who doesn't think of spring when they see tulips in bloom?? These members of the lily family typically grow a single stem and flower from teardrop-shaped bulbs that are planted in fall for spring flowers. 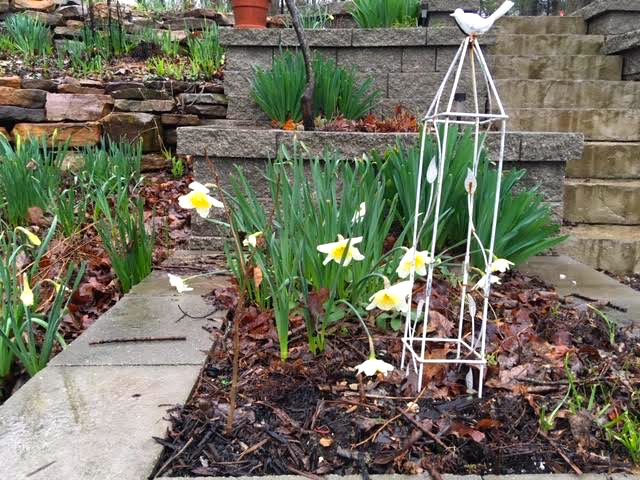 Tulip bulbs require a dormancy period with cool, winter-like temperatures for several weeks. During this time, the bulbs sprout roots and the embryonic leaves and flowers inside the bulb begin to develop. Tulips are native to southern Europe, the eastern Mediterranean, North Africa and Asia. Works of art depicting their distinctive shape date back to the 10th century. They have been cultivated in earnest for at least 400 years including generating the short-lived "tulipmania" in the 1600s where collectors were spending literally fortunes to possess one tulip bulb. 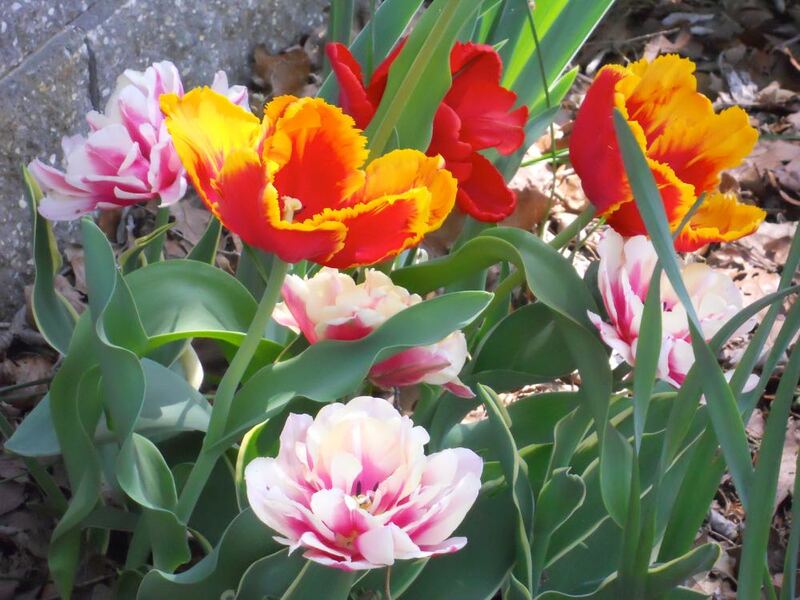 By leveraging the tulip’s natural tendency toward diversity, generations of breeders and tulip collectors have produced a mind-boggling array of flower forms, heights, colors and bloom times. Today, Holland produces most of the world’s annual tulip crop, which exceeds 4 billion bulbs annually. There are more than 150 species of tulips with over 3,000 different varieties and are classified into Divisions by type. The tulip names include links to a variety of suppliers so you can see the actual tulip varieties. As members of the lily family, tulips are also relatives to onions. These are my dwarf fruit trees covered in fleece and cotton sheets during our last cold spell. Do Cotton Sheets Work to Safe Fruit Buds? This last cold spell was four days long. I didn't know at the time it was also part of the coldest spring in Missouri's recorded history. I have been trying different materials to see which ones work the best to protect my fruit tree flowers from getting nipped during this late winter freezes. Over the years I have tried bird seed bags, corn bags, a variety of blankets and settled on cotton - sheets, pillow cases and lightweight fleece blankets. I will cover them with plastic bags if rain is in the forecast but without a chance of precipitation its all about keeping the flowers from getting blasted. After four days, I wasn't sure if they had been covered for too long or not so as soon as there was sunshine and temperatures in the evening over freezing, off came the sheets. My uncovered dwarf fruit tree flowers are none worse the wear for being covered in cotton. After giving the dwarf fruit trees a few hours to enjoy the sun, I went back to check to see how the covered flowers were doing. These are dwarf patio peach trees. Dwarf patio peach trees made it through this last freeze covered in cotton pillow cases. 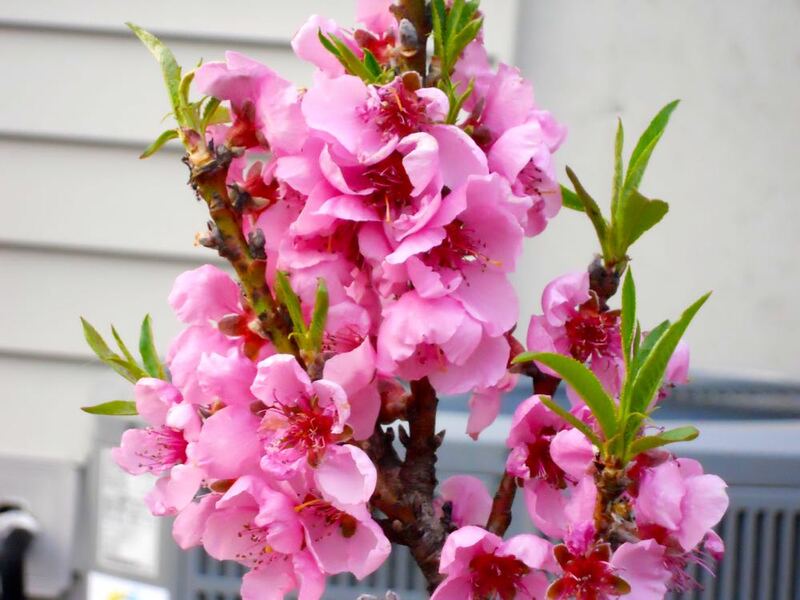 One of my favorite spring-blooming dwarf fruit tree is the apricot, the vibrant pink color is just lovely. My lovely dwarf apricot required two sheets to give it full coverage from the last freeze. As I was heading back to the front of the house, I saw honeybees visiting the recently uncovered blooms. One of my honeybees visits the dwarf patio peach tree blossoms saved by cotton sheets. That made all of the effort to cover up the trees worthwhile! Did you know there are more microorganisms in a tablespoon of soil than there are people on earth? Soil is an amazing recycling operation, a constant re-combining of minerals and decaying plants and animals. An average soil sample is 45 percent minerals, 25 percent water, 25 percent air, and five percent organic matter. Different-sized mineral particles, such as sand, silt, and clay, give soil its texture. How fast water interacts, or doesn’t interact with those mineral particles, determines how well different plant varieties can pull the nutrition they need. Then there are the good soil organisms and the bad ones that, once out of balance, can turn soil communities into infertile landscapes. 1. Fill a quart jar one-third full with topsoil and add water until the jar is almost full. Screw on the lid and shake the mixture until all the clumps of soil have dissolved. 2. Set the jar on a windowsill and watch as the larger particles begin to sink to the bottom. In a minute or two, the sand portion of the soil will have settled to the jar bottom. Mark the level of sand on the jar side. A colored magic marker will work, you can wash it off later. 3. Leave the jar undisturbed for several hours. The finer silt particles will gradually settle. 4. Leave the jar overnight. The next layer above the silt will be clay. Mark the thickness of that layer. On top of the clay should be a thin layer of organic matter. Some of this organic matter may still be floating in the water. In fact, the jar should be murky and full of floating organic sediments. If not, you probably need to add organic matter to improve the soil's fertility and structure. Not sure what you are seeing? I can understand, sometimes it all looks like a big muddy blob. Take a good look until your eyes can distinguish between colors. Give up? Ok, but don’t toss it down the sink, pour it on a flower bed, there is another way. 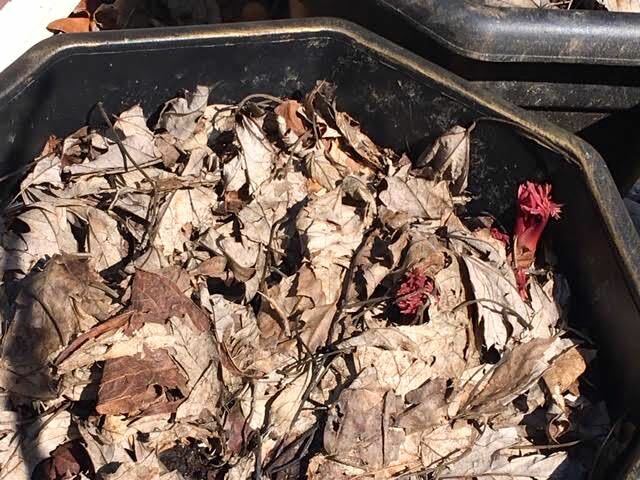 Collect about 6 scoops or 1.5 cups of soil from 6-8 points from a good 4-6 inches below ground from around your garden in a plastic bag and take it down to your local University of Missouri Extension Office. For $15, they will send the samples off to a lab. In a couple of weeks, you will get a very detailed analysis back with a detailed report of your soil including ph levels and recommendations of what you need to do, if any, to improve your soil. The report will also help guide you in what you can plant in your soil conditions and how to amend your soil for optimum garden growing conditions. Take your time with whatever you do, most soil amendments take time. 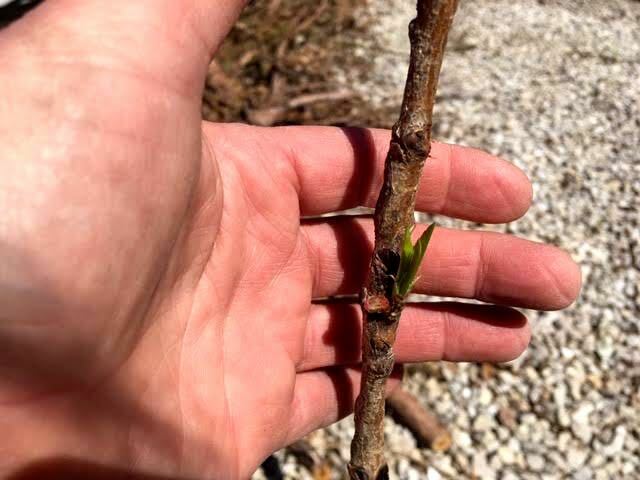 Lightweight blankets, sheets and cotton pillow cases cover my flowering fruit trees early April. Hopefully it's the last snow of the year but the forecast was ill-timed. Some of my dwarf fruit trees were flowering, their pink buds and round little posies threatened by the below freezing temperatures. Over the years, I have covered them with a number of different textiles to see which ones work the best against frost and freezing temperatures. As long as it doesn't rain, cotton sheets, pillow cases and lightweight fleece blankets and coats seem to protect them the best without causing damage as they are unwrapped later. If there is wet precipitation, then adding something over to shield the cotton helps. Bird seed bags, corn bags and plastic dry cleaning bags have helped to keep the cotton from adding weight to the branches. These dwarf fruit trees have been covered for three days against the cold. Hopefully they will get unwrapped in another day or so and the flowers will warm up enough to entice the bees with freshly-produced nectar. I'm sure the bees will be happy to be out of their hives as well! My herbs, tomatoes, peppers and yes, a banana plant on my back deck garden. Behind in gardening chores? So am I. It’s been such a wet spring, it’s hard to get anything in the ground, let alone much mowed. The plants sure have taken advantage of all of the moisture. And just think, June is traditionally our wettest month of the year. 1. Japanese beetles show up this month so hand pick and drop in a bucket of water with soap. Also treat your lawn with nematodes and milky spores, both will gradually help eliminate grubs. 2. Trim lilacs now so growth the rest of this year will provide blooms next year. 3. Get your flower pots planted. 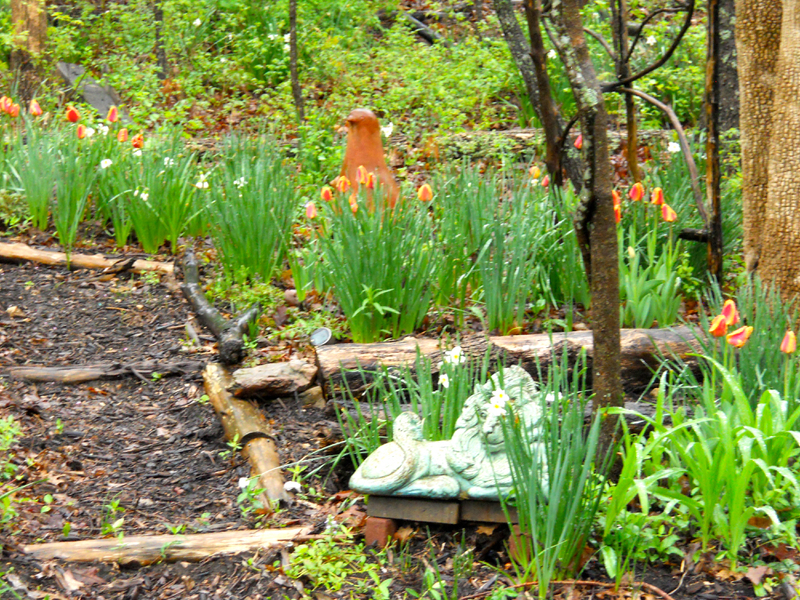 Water the soil first, let drain, then add your flowers for better adjustment. 4. When planting vegetables, plant a new supply every 2 weeks to give yourself a new crop through the season. 5. Keep your asparagus bed weeded and let the green top ferns grow until they go brown, do not cut. 6. As rain stops, make sure to water deeply in the root zone. Don’t sprinkle on leaves, that’s a waste of water and does nothing for your plants. 7. Pinch mums weekly through July 4th to keep them bushy and delay bloom until fall. 8. 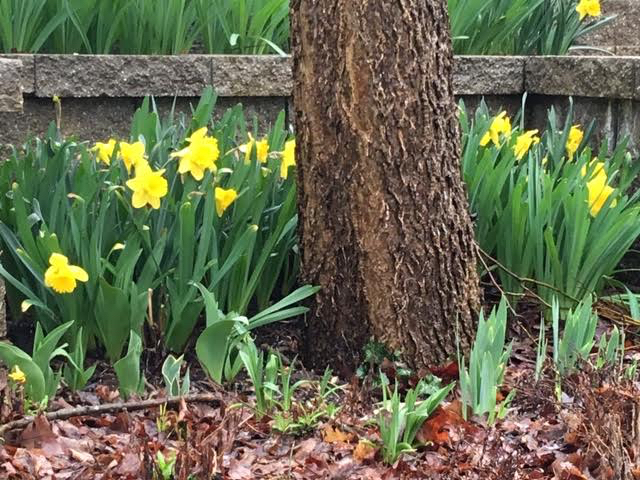 Leave spring bulb greenery to die off naturally. I gently remove the yellow leaves if they bug me and plant summer perennials to cover them in the meantime. 9. Plant annual flower seeds, such as zinnias, sunflowers, forget-me-nots, cosmos, marigolds and herbs. 10. Mulch your vegetables, even those growing in pots. Shredded leaves, shredded paper and torn cardboard all work under dried grass and leaves. This dill and purslane volunteered from last year. Gardening doesn't get much easier than that! 11. 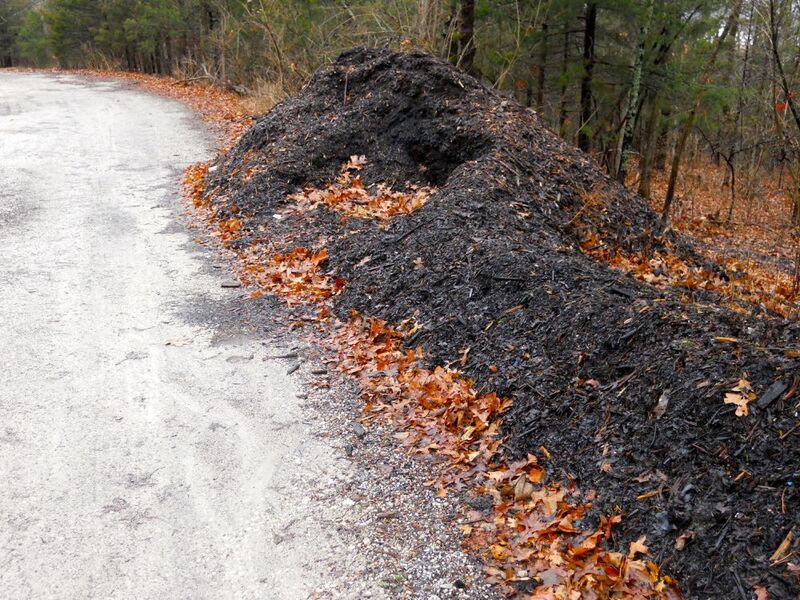 When mulching, leave 2-4 inches clear from the plant stem and the mulch ring no larger than 5 inches deep. More than that and you are smothering the plant itself. 12. Check for dead limbs and remove before they fall on someone. 13. When planting wildflowers, mark the beds where seeds have been added. 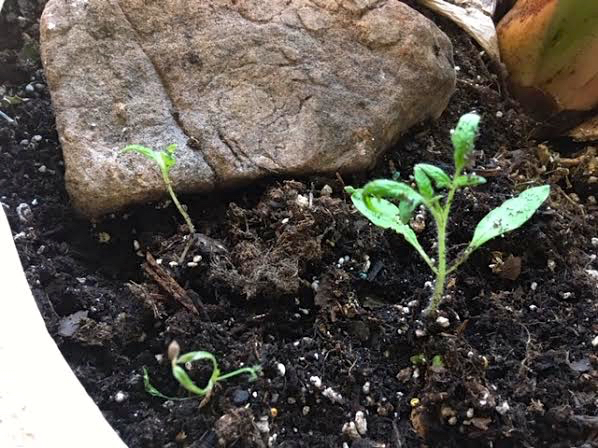 Some wildflowers may take 2 years to germinate. 14. 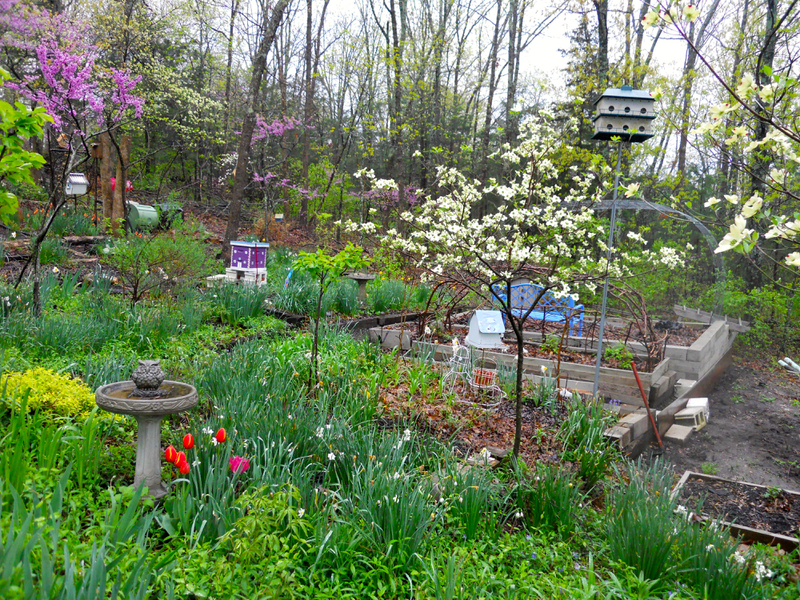 Add bird baths for interest and a bird water source. Birds will help keep unwanted insects down. 15. Feed roses and other plants compost to give them a good source of energy. 16. For those of you with grass, don’t cut more than 1/3 of the grass down at one time. 17. When making new flower beds, use cardboard boxes to kill off unwanted plants. Add shredded leaves, grass clippings, mulch to get the bed ready for fall planting. 18. Take photos of your garden. Use the same photo spots you used in spring so you can see the changes from one season to the next. 19. When adding perennials, focus on native plants. Once established, they will require less water and care than non-natives and Missouri has a lovely array of native plants to choose from. 20. Make sure to have a seating area in a cool garden spot so you can sit down and enjoy all of the work you have invested in your garden. This is one of my inside cats supervising the hummingbird feeder out of the window to my deck. This cat in particular takes her supervisory duties very seriously and lets me know whenever there is a hummingbird at the feeder. With all of the other spring signs several weeks early this year, I decided to put out my hummingbird feeders a few weeks early and turns out, I was just in time. Hummingbirds winter over in Central and South America, migrating back north for our spring and summer while the southern hemisphere goes into its winter season. As they migrate north, the male hummingbirds are the first to show up at backyard feeders. They are the scouts, checking out food and nesting areas for the incoming females. This year, I had one ruby-throated hummingbird at the feeder off my deck the first day I put out the feeder. The story of how hummingbirds make this trip is amazing. During migration, a hummingbird's heart beats up to 1,260 times a minute, and its wings flap 15 to 80 times a second. They fly alone, often on the same path they have flown earlier in their life, and they fly low, just above tree tops or water. Flying low allows the birds to see, and stop at, food supplies along the way. They are also experts at using tail winds to help reach their destination faster. Research indicates a hummingbird can travel as much as 23 miles in one day. You can help feed hummingbirds with a simple solution of sugar water. I make my sugar syrup one part sugar, 4 parts water. Mix the sugar in hot water out of the tap until the sugar dissolves completely. You don’t want to boil the water unless you boil, then let it cool off because boiled water can be too hot. Once cooled, I store the sugar water in the refrigerator and only fill the hummingbird feeders halfway so the sugar water doesn’t spoil. Then change the sugar water every week or so; more often in warmer weather. When cleaning out the hummingbird feeders, don’t use soap or any other cleaning agent or you may find the hummingbirds won’t use the hummingbird feeder. To keep mine clean, I rinse out with hot water and a give it a good scrubbing, then add a little dab of bleach in the water to remove any leftover mold and rinse well. There was a nursery rhyme where I grew up in Brazil about hummingbirds getting rides on the backs of geese. I was at a conference of biologists many years ago listening to one present his theory of how those tiny birds make the long trek across the Gulf of Mexico. After basically saying they couldn’t prove beyond a shadow of a doubt how hummingbirds fly across that long expanse of water without food, I mentioned the nursery rhyme and asked if there was any possibility that those two species worked together. The scientist said no, they knew the hummingbirds made it across the Gulf of Mexico because they found their little exhausted bodies along the shoreline.